Have not listened yet, but can't wait. The Chinese town of Shijiao is known for recycling discarded Christmas tree lights for their copper and wire insulation, which are then used to support growing economies and make slipper soles, respectively. In Junkyard Planet, Adam Minter explores the business of recycling what developed nations throw away. 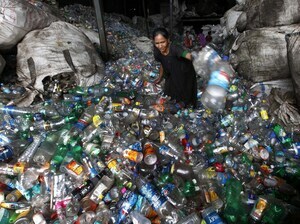 Coming Up: The author of Junkyard Planet explains the global billion-dollar trash trade, Wednesday on NPR's Fresh Air.